Whether from flooding, a strong rainstorm or a pipe burst, water can cause some serious damage and the problem should be fixed immediately. We handle water damage cases of various severities and ensure the affected areas are clear before we leave. Mold can be dangerous and potentially toxic. Not to mention, if you have mold, water could be leaking into your home or business as well. Call us once you spot mold and we’ll come out to do a free assessment of the damage. If you fear that your home didn’t hold up so well against the past storm or have acquired some serious damage to the exterior of your home from high winds, call us. Our dedicated team will come out and fix the issues as soon as possible, ensuring your property holds up against future storms. If it is an emergency, we will send someone out right away to assist. Dirt, dust and the most recent thing you have eaten while sitting on your couch could cause it to break down, not to mention, make it dirty. Extend the life of your upholstery by regularly getting it cleaned. Our team uses the safest products and guarantees quality service. If it’s been a couple years since you’ve had your air ducts cleaned and your property seems to be abnormally dusty, it’s time for ductwork cleaning. 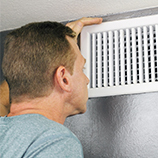 Our team cleans air duct vents efficiently and at an affordable price. With more than 30 years of experience in the industry, we have repaired the damage done by large and small fires. Call us as soon as you can after fire plagues your property. Our fire restoration company cleans the affected area and fixes any problems. We offer quality service at affordable prices. 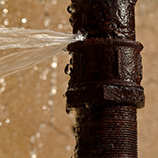 From heavy rain runoff to pipe failures, we handle it all. Running and sitting water can cause extensive damage, especially to the interior of your home or business. Call us for help. We are available 24 hours a day with expected response times of two to four hours from your first call. Experience a healthy indoor atmosphere with expert carpet cleaning services by All Clear. Eliminating spots and stains while freshening and restoring your entire floor, our courteous experts promise a superior result at an affordable rate. Clogged and dirty air ducts are a major source of dust and dander, creating poor indoor air quality and causing a myriad of health problems, including respiratory issues. Clearing your ducts and vents of dust and allergens, our duct-cleaning technicians offer superior workmanship and customer care with each and every visit.